I have always had to work hard to stay at a healthy weight (sometimes it has worked better than others! ), and I find that the best way for me to eat well and healthily is to plan my meals and snacks. I mostly pack my snack for our morning outing when I pack the boys lunch boxes the night before, that way there’s not as much temptation to cave in and buy junk – especially when I know how yummy the snacks ready waiting for me are. To aid in my baking adventures, I was given the River Cottage ‘Everyday’ cookbook for mother’s day (I have to confess that I am a little bit in love with Hugh and I often wish I lived at River Cottage … but given that I live in the middle of the desert and that I am a real veggie growing novice, I am just making do with some of his amazing recipes for now!). 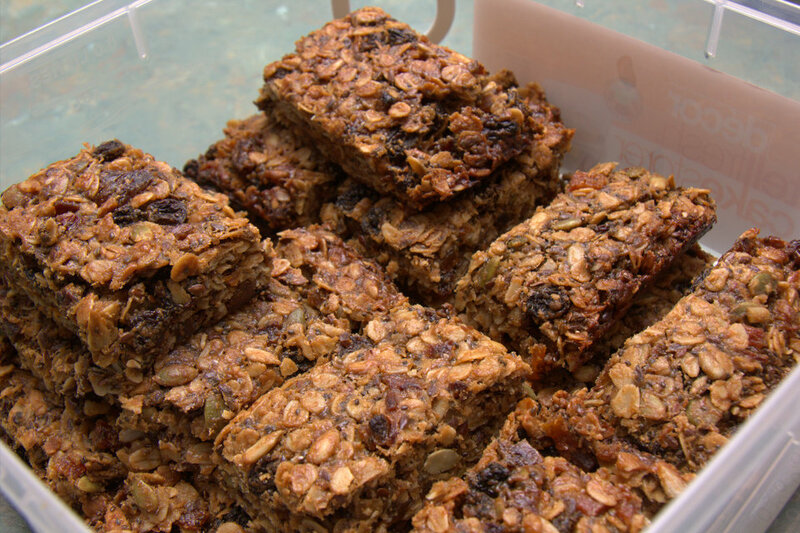 This muesli bar recipe is adapted from one of the recipes that I first saw on his show. It is probably more of a ‘grown ups’ recipe but I have taken to packing some for my boys when I have them because otherwise they just pinch mine! Mix all above ingredients in a large saucepan and cook over low heat until all melted and mixed together. Stir in thoroughly, press the mixture down firmly into a greased baking pan and cook in a preheated oven at 160 C for approx 45 mins, or until golden. I find it’s best to leave it in the fridge for an hour or so before I cut it up, then store it in the fridge in an airtight container and it keeps well for a fortnight. This makes a large batch and it is quite calorie dense, but because of all the protein and good oils it is filling and you don’t need a huge serving to be satisfied. Great for school lunchboxes when you’re at a ‘nut-free school and it can also serve as a quick and filling breakfast. To make this Coeliac Friendly replace the oats with equal weight of a mix of puffed rice, rolled quinoa and desiccated coconut.